Fancy learning a little more about us? Spain Buddy was launched in late September 2012, is a rapidly growing project, and the newest member of the Gandy-Draper group of websites… owned, managed and populated by Alan Gandy & Elle Draper as well as an intrepid group of guest writers. 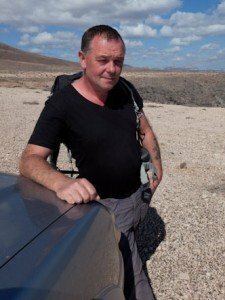 Alan was born in the North of England (Lancashire) and travelled extensively before meeting Elle through work, with whom he now lives in Almería. Alan has three sons by the first of his 18 marriages*, (Sam, Joe & Ben) who are all now adults and making their way in the world. Alan has a strong Public Relations and Project Management background, and a veracity that takes no prisoners. He has worked at senior management and director level for a number of businesses across the globe. He has a strong reputation for getting things done, and achieving the impossible, but draws the line at rescuing cats from trees. He is never scared to voice his views, and has no fear of corporate bullies. He campaigns for the little man, makes things right, fights crime in a black cape and tight yellow pants, and generally enjoys being an all round super hero. Alan loves fast cars and faster women – however Elle keeps a tight rein on those things these days… at least until she has him insured for a few cool million… at which point she may be paying close attention to the brakes on his Ferrari. Elle too was born in the North of England (York). However she spent most of her childhood on the South Coast where she developed a delicate “Pompey Fishwife” accent that Alan ‘loves’ to hear at volume. She has a strong background in sales, and has worked in pub management and call centre recruitment, and at senior operation management level in the electronics industry. Elle is one of those sickeningly chirpy optimistic people, who sees the best in everything and everyone, and while others view their glasses as half full, she sees hers as an opportunity for a top-up of more wine or vodka plus she’ll usually get a round of shots in while she’s waiting. Negativity bores her and bigots, bullies and racists are neither entertained nor tolerated. Elle loves to organise and is a whizz at project management. Take a quick look in her kitchen drawers, fridge or cupboards and you will see all jars, tins, and ingredients are stored alphabetically by type, and with all labels facing the front. Cutlery all faces the same direction (sharp ends to the left), and as for the DVDs and music CDs… well you can guess how that goes. Microsoft Excel is her favourite computer program, and she runs spreadsheets for everything from client website statistics to shopping lists and telly program scheduling to client databases. She tends to provide the design, writing, customer service and operational side of Gandy-Draper’s businesses… whilst Alan provides the creativity, strategy, technical support, wine and entertainment. Elle also provides business support for a number of international clients while wearing a variety of business “hats”. She is a firm believer in the 25 hour eight day working week. She does, however, live in hope of a Euromillions win. Elle enjoys being the centre of attention, and has been known to sashay into a karaoke bar and belt out her version of “Hanky Panky” by Madonna. The world breathed a sigh of relief in November 2011, however, when Elle hung up her microphone for the last time declaring “life is too short for this cr@p!” She has not picked up a microphone since but has replaced it with more wine instead. All joking aside, Elle and Alan work hard to ensure the highest standards of care and quality for their clients. They have worked together closely since 2004, and have managed their own business since 2006, when they first moved to Playa Blanca, Lanzarote where they lived the resort life for six years. In September 2012, they moved to their hillside haven in Llano del Espino, Almería, where they spent four blissful years enjoying the ambient sounds of “El Campo” – horses, goats, chickens, dogs and various other forms of wildlife. However, as peaceful as that life was – they missed the buzz of being part of a community (plus having shops and bars within a handy distance) and so in July 2016 they ventured into the heart of what is one of Spain’s most beautiful towns – Vélez-Blanco – which is also in Almería. Welcomed immediately with open arms, they are busy making friends with the locals and enjoying everything this idyllic town has to offer. It became apparent very quickly that they had found their “forever home,” and do not foresee a move anywhere else. They share their home with their three dogs: Guido (a grumpy but doe-eyed Labrador/Beagle cross), Pepper (a huge loving dopey bear of a Labrador), and Billy Boxer (a lanky mental ginger Boxer). They love their dogs, good food, good honest chatty company, big belly laughs and a drop or twelve of vino collapso or vodka. Elle and Alan supply web design services to the Canary Islands, mainland Spain, the UK, Germany, France, Canada, Australia, Dubai and the United States. But it is Spain Buddy where their focus has evolved. The success of the website has been excellent, and the rapidly growing hordes of fans has proved they were right to launch it back in September 2012. Spain Web Design – Gandy-Draper’s web design and SEO website. 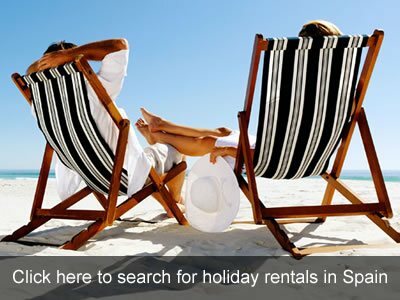 Pet Friendly Breaks – directory of pet friendly accommodation, worldwide. FREE for property owners to list. Relaunching in 2017. So now you know a little more about us. We operate transparently… no hiding behind a website name for us – if you are talking to Spain Buddy you are talking to Alan and Elle. *(Ed: Despite typing a stupidly high number… people still ask if Alan really has been married that often. No of course he hasn’t – don’t be ridiculous).